Germany and France will try to reconcile divergent visions of how to fix Europe’s economy today (22 September) when Manuel Valls makes his first visit to Berlin as French prime minister and holds talks with Angela Merkel. The trip comes at a watershed moment, with the region struggling to shake off the aftermath of a prolonged financial crisis that has left its citizens poorer, increasingly jobless and turning to extremist politicians for answers. But the risk is that Valls and Merkel talk past each other: the Frenchman urging a dash for growth and understanding from Berlin on France’s broken fiscal promises, and the German leader demanding the politically impossible of Paris on budgetary rigour and reform. The outcome of their one-hour lunch in Merkel’s chancellery will be scrutinised in other eurozone capitals – not least in Athens, Dublin, Portugal and Madrid, where leaders have played by the EU rule book and subjected their countries to genuine austerity. “We have no interest in humiliating the French,” said one German official who requested anonymity. A decade ago, past leaders of Europe’s two largest economies reneged on promises to rein in their public deficits – a transgression some say undermined the bloc’s rules on budget discipline and helped set the stage for its sovereign debt crisis five years later. The difference is that Berlin gradually went about bringing its fiscal house into order, imposing wage moderation and enacting controversial labour reforms. France largely stood still – and missed at least three more deficit targets. Earlier this month, it acknowledged that it would not bring its deficit down within EU limits until 2017. Initially, it had pledged to do so by 2013, before winning a reprieve until 2015. “Granting France yet another two years on the deficit will create problems in other euro zone members,” said Daniela Schwarzer of the German Marshall Fund in Berlin. Valls is a centrist within the Socialist party who, ahead of his Berlin visit, has repeatedly name-checked Gerhard Schroeder, the Social Democrat ex-chancellor credited with Germany’s reform push of the 2000s. He will aim to convince Merkel he can do the same job for France. His agenda in Germany sends an economy-friendly signal. 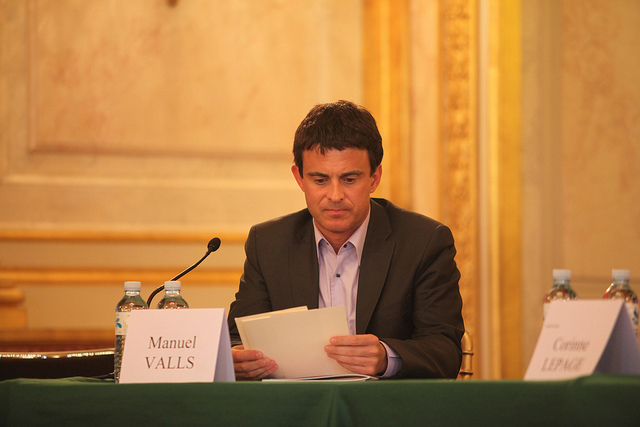 After a red carpet welcome with military honours on Monday, Valls will give a speech to German businessmen on Tuesday. He then travels to the Hamburg site of Franco-German planemaker Airbus, and to Stuttgart, the heart of German industrial might. The snag is that what Valls can achieve during the remaining two years of President François Hollande’s term may fall well short of Merkel’s expectations. Two main reform projects are currently in the works: a “law on growth” aimed at freeing up trading hours, and tightly regulated sectors in the French economy from pharmacists to legal professionals; and an easing of restrictions on companies to provide worker representation and other benefits. Both are controversial with unions and the French left and have already sparked street protests and threats of strikes. Yet few in Berlin believe that reforms being undertaken in France currently match those done in Germany. “Very little has been done. They need to do much more,” said an aide to the chancellor. Valls survived a confidence vote on his newly reshuffled government last week but did not obtain an absolute majority – meaning that any future attempts to rein in public spending or enact reforms risk being held hostage by rebel leftists. Moreover, his once-healthy poll ratings have been hit by his association with Hollande, whose public standing has been ripped to shreds by his failure to improve the lot of ordinary French, his indecisive leadership, and messy private life. The contrast with Merkel, who has emerged as Europe’s dominant leader with popularity ratings at home of over 70%, could not be greater. Valls will do his best to ignore the imbalance and project an image of strength in Berlin, telling reporters on Friday he was looking forward to the meeting “in a positive spirit” but was not there to seek Germany’s indulgence. He will point to French air strikes against Islamic State (IS) militants in Iraq, which began Friday, as proof Paris takes its responsibilities seriously. Germany agreed to send arms to Kurdish fighters battling IS but will have no part in strikes. Any signs from Valls of weakness in Berlin would be seized upon by his political opponents at home, above all Marine Le Pen and her France-first National Front. “The central argument of Valls will be: we haven’t changed our goals but there is less growth in Europe, less growth in France and less inflation. The context has changed, not the will to reform,” said Claire Demesmay of the German Council on Foreign Relations (DGAP). Whether Merkel accepts this argument is doubtful. She also has political constraints in the form of the Alternative for Germany (AfD), a rising new German Eurosceptic party that is unsettling her Christian Democrats (CDU). If she goes too easy on France – for example granting Paris more time on the deficit without new reform commitments – the AfD, and many within her own party, would cry foul. Nor is Merkel likely to accede to French wishes for more German stimulus. Her government’s top goal is to deliver on its own promise to balance the federal budget next year for the first time since 1969. Any spending that might endanger this target is seen as taboo. “The chancellor is adamant about this,” the Merkel aide said. And if Berlin allows leeway on the deficit, France must be seen to do something in return. “Behind closed doors, while Germany will certainly push France on reform and (budget) consolidation, France will be given more time and flexibility,” said Christian Odendahl, chief economist at the London-based Centre for European Reform (CER). German Chancellor Angela Merkel has openly stated her belief that the eurozone crisis could not be overcome without a treaty change to transfer national competences – such as budgets – to European institutions. She is backed by the European Commission President José Manuel Barroso, who has pushed for “further political and institutional integration” and a consolidation of “a truly political union” through a change of the EU treaty. One largely-accepted idea is to introduce a special eurozone budget that would provide the financial ammunition to help achieve economic reforms in countries under stress. A specific "Treasury within the Commission" would deal with monitoring and managing that budget. But Paris and Berlin have clashed publicly over the content of reforms, with Merkel pushing for longer term “political union” and French President François Hollande placing the emphasis on short-term measures to restart the economy and tackle unemployment. Hollande also argued for more “solidarity”, saying the eurozone needed some form of debt pooling instrument to bring down the borrowing costs of troubled economies, a move resisted in Berlin, which says such a move can only take place at the end of a political integration process, with new powers transferred to Brussels.